If you’re looking for more Star Wars after seeing Rogue One, tonight’s episode of Rebels is worth checking out. I’m a fan of the show, but have to admit it’s at its best when connected to the larger Star Wars universe and characters. Judging by the Rebels mid-season trailer below, there’s no lack of connections going into the second half of Season Three and that begins with the two-part Ghosts of Geonosis tonight. 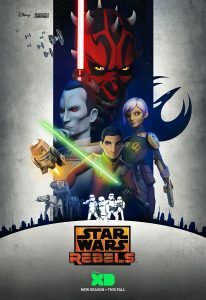 Rebels uses its setting between the two original Star Wars trilogies to bring in some of the most appealing elements from each. It’s great to see the series capitalize on Rogue One sharing that same time period. Without spoiling anything, I can say that tonight’s episodes provide much more than a brief cameo or reference to the movie and make for a great return for the show. Of course, the story I’m most looking forward to will come sometime later in the season. I’m in for anything with Ben Kenobi and the show is doing a tremendous job building to his appearance. The trailer is packed with exciting peeks at what’s coming next and I highly recommend tuning in to seeing it all unfold. Star Wars Rebels returns on Saturday, January 7, at 8:30 p.m. ET/PT on Disney XD.